A new study has found that drivers fail to the benefits automated and driverless vehicles. 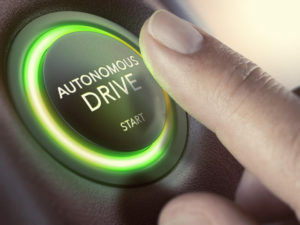 The promised benefits of automated and driverless vehicles are not views shared by drivers, a new study of 2,000 people by Continental Tyres has found. The second most popular response to what benefits drivers believed driverless vehicles would offer was, “none”, with more than a third of respondents unable to identify a single advantage of the technology. The study also found that motorists are three times as likely (44%) to be scared of autonomous vehicles due to a loss of personal control, than realise their potential benefits. 37% of respondents said they felt people are becoming too lazy and reliant on technology, while 35% felt there are too many risks associated with the technology, for example being hacked. Just half of all respondents believed the priority for automotive and technology companies should be to improve road safety, followed by nearly 50% saying more economical vehicles using existing and “new fuels” should be prioritised, while 47% said reducing road traffic should be number one on the agenda. 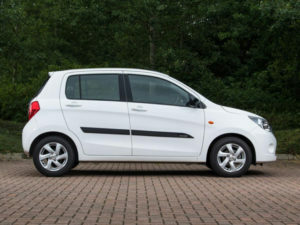 Suzuki has announced their latest special edition limited model, The Celerio City. Just 500 units of The City based hatchback will be built upon the SZ2 trim grade, with DAB CD tuner, six airbags, drivers seat height adjust, central locking. The City special edition adds more than £800 of extras, including alloy wheels, rear parking sensors, black body side mouldings with Celerio logo, black B-Pillar covers and City badging. Suzuki currently has a £500 reduction campaign on Celerio models, until 30 Septembe 2017, meaning The City model is available from £7,499, the company says. Two solid colours are available as standard at no extra cost and three optional metallic colours including, “Cerulean Blue Metallic”, “Mineral Grey Metallic” and “Star Silver Metallic” cost £465. For customers looking at a Personal Contract Purchase (PCP) option, Celerio City is also included in the low rate 5.9% APR campaign until the end of September. Payments are just £85 per month when spread over 48 months after a deposit of £2,044 is made, the agreement has a final optional payment of £2,298 to keep the car at the end of the term. 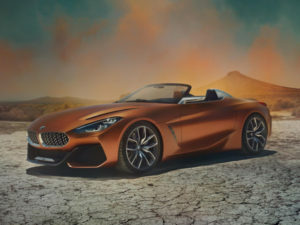 BMW’s long awaited replacement for the ageing Z4 has had its first concept world premiere at the annual Monterey Car Week Press Conference at the Lodge at Pebble Beach Concours d’Elegance, alongside the BMW Concept 8 Series, which made its debut appearance in May. The Z4 Concept is a preview of the series production car, scheduled for release over the next 12-months, BMW confirmed and could include hybrid technology shared with Toyota. The two-seater was developed as part of an ongoing collaboration between the two brands, formed in 2012, which includes sharing hybrid and fuel cell technologies as well as a sports car platform. Though BMW has yet to confirm engine options, the partnership suggested that the sports car platform would utilise its experience in “efficient, highly-dynamic premium vehicles” while Toyota would contribute its “environmentally friendly hybrid and fuel-cell technology” to the project. BMW announced last week that it had delivered more than 50,000 plug-in vehicles globally so far this year; a 75% year-on-year increase, and enough to make it the world’s third-largest manufacturer of electric and plug-in hybrid vehicles.